On Sunday, Mothers Day, Jeff treated me to a beer festival. How thoughtful. After visiting the Porsche Museum and Burg Hohenzollern the day before, we finally made it to the Stuttgart Frühlingsfest (Spring Fest). The festival takes place on the same grounds as the bigger, fall Cannstatter Volksfest. The two-week Spring Fest has a huge midway, carnival ride area which takes up most of the festival grounds. During the fall festival there are around eight large beer tents; in the Spring Fest, just three. We had reserved tables with a group of twenty people, right up front, just below the band. It was pretty much the same atmosphere as Oktoberfest or the Cannstatter Volksfest, loud music, singing, glass mugs clanking together, Prosting; everything. However, because of Mothers Day our tent was only half full but, of course, it was the half in front of the band. Spring festivals like this are quite fun because they signal to people that summer is almost here and the wine and beer fest season has begun. Part of the Frühlingsfest was a car rally that ran through the city. We watched for a bit and saw some great cars whiz by. Here's an old one . . .
. . . and a new one. Finally on the festival grounds. First time we've seen one of these at a German fetival; Der Riesen Hamburger (The Giant Hamburger). It doesn't look like it in this picture but they were doing a pretty good business. A brat and a beer. Almost everything a guy needs. 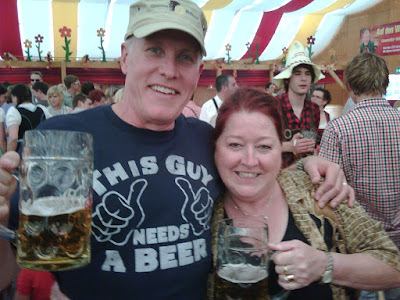 We were in the Grandl Hofbrau Zelt (Tent) which sells one of the local beers, Stuttgarter Hofbrau. Doesn't that first letter of Stuttgarter look like a G? Must be some Gothic S.
If you've ever been to a German wine or beer festival you're familiar with the tables and benches they use; very efficient and sturdy. Here at the Stuttgart Spring Fest we saw something we'd never seen before. They bolted the table and benchs to the floor. Makes it a lot safer when you're standing on top of them which is always inevitable. Plus, look at the room between the benches. At Oktoberfest those benches are backed up to each other, no room between. This was nice for extra festing room and allowed you to move about much more easily. Here Jeff and I are with our long-time friends Gloria and Mike Ryan, who now live in Stuttgart. Did I say we were right in front of the band? This is how close we were. These big, heavy glass beer mugs aren't indestructable. Here's a dead soldier. There's all kinds of Lederhosen but you're just nobody unless you've got a shiney, bright green pair. Pretty cool! We had a great weekend!! Porsche Museum, Burg Hohenzollern and all topped off with a nice, tune-up beer festival. PROST!! I like Daddy's shirt! Such a perfect shirt to wear at these festivals! I like the giant hamburger too. Can't wait for Oktoberfest.